Welcome to the next part of facial expressions drawing! Start off by constructing the head, first with a sphere, and then by drawing in the mandible. If you’re having any problems with this, try going back to the face fundamentals video series from LaurieB! She will walk you through everything that you need to feel comfortable drawing the heads in these expression lessons. After your head is drawn, go ahead and add in the mouth. Notice the major curve of the upper and lower lips – they are both curving away from each other. Would your lips naturally curve like this if you tried to make a scared expression like this? I’m not going to tell you the answer – take a 10 second break to look in a mirror and try making your own expression. 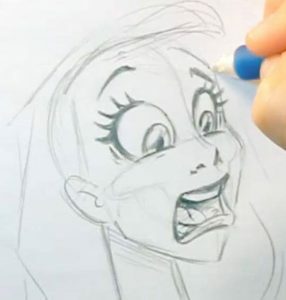 And, when learning facial expressions drawing techniques, always remember that you are your own best reference – you’re usually just a mirror away from finding the answer you need! 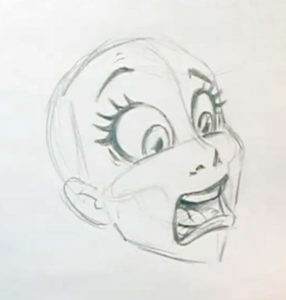 The next thing to draw is the eyes, eyebrows and the lines along the bottom of the eyes where the expression is pushing the cheeks up against the lower eyelids. Take not in this image how the eyebrows are flowing along the same curve. 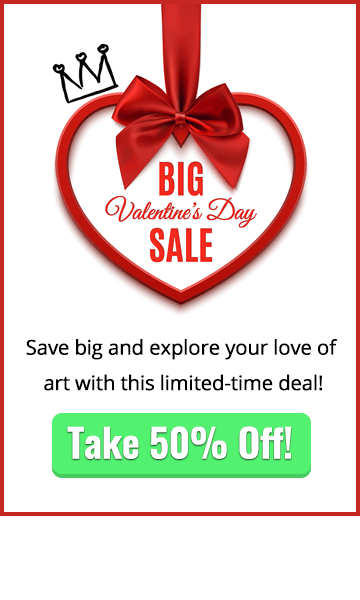 Facial Expressions Drawing: More Details! 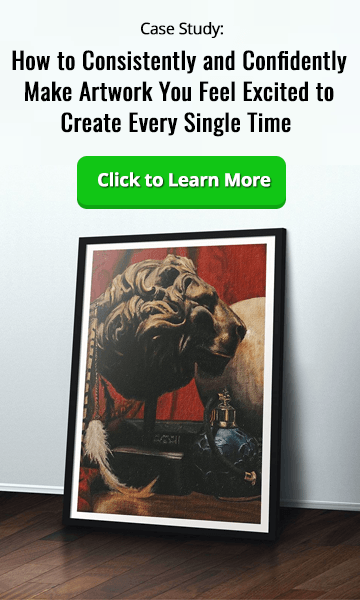 The example image for this might look a bit challenging, but just focus on drawing the individual parts on their own and don’t get overwhelmed. 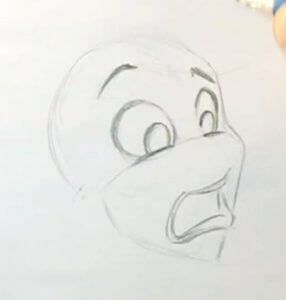 Most of the features are straightforward, but when learning facial expressions drawing, one thing to pay attention to specifically here is the nose. 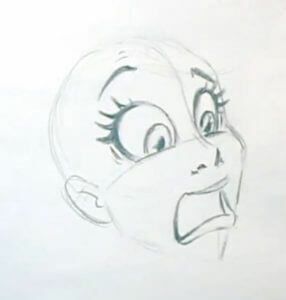 Many artists have a tendency to ‘overdraw’ the nose by adding too many lines, or using lines that are too dark. When drawing female characters, the nose is an especially important detail that you want to keep light and delicate. LaurieB! 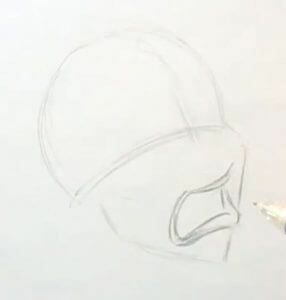 does a great example of how the nose should be drawn from this angle, and it’s worth spending a few extra moments to practice drawing this simplified nose. 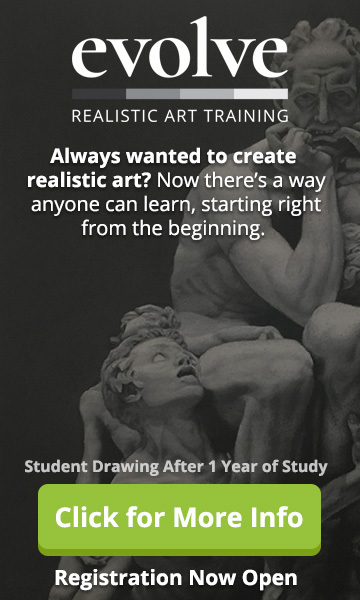 This way, you’ll know exactly what to draw for next time! Remember how your spent all that time learning about how the skull was put together in the face fundamentals drawing series? Well, now you can put it to further use by using that knowledge to perfectly place the teeth on your characters.This is a great little trick for facial expressions drawing that you can use no matter who you are drawing: male or female, young or old, it doesn’t matter. You can use the skull to figure out where to place the teeth on anyone! Add some light lines to indicate the hair, the neck and a little bit of shading and highlight on the eye to finish up this drawing. Because we’re focusing on the expressions only here, don’t worry about spending too much time worrying about these final details. Let’s get it finished up and then move right on to the next lesson on facial expressions drawing!